At the point where the lazy, black-water Cuyabeno runs into the faster currents of the Aguarico, carrying a chill from their Andean source, sandbars stretch out from the verdant banks. These are the Playas de Cuyabeno, and the name has attached itself to the indigenous Cofan community in this region, deep inside Ecuador’s portion of the Amazon Basin. Until very recently, an assortment of thatched, wooden dwellings sat above the river. Today it has been replaced by an orderly hamlet of evenly spaced, two-story, prefab houses, all steel and white plaster, connected by improbably clean roads, and sprinkled with basketball courts and childrens’ playgrounds. This is Ecuador’s first Comunidad de Milenio (Millenium Community), a $21 million benefit from the proceeds of the Pañacocha oil field that borders the community. Under the terms of the country’s 2010 Hydrocarbon Law, a portion of the royalties from oil production must be ploughed back into the communities affected by drilling and extraction. For his devotees, the comunidads are the latest perks of his “citizens’ revolution,” which has seen one of the most ambitious, and costly, assaults on poverty in South America. Correa rarely fails to point out that his country’s oil royalties are no longer flowing to the oligarchs in Quito, Guayaquil, Miami or Houston, and that they are bettering the lives of all (in accord with his administration’s Buen Vivir national plan). In almost every sector—access to free education and healthcare, dignified housing, public works, labor and disability rights, social security, fair wages, broadband access and economic growth—the performance indicators are impressive. 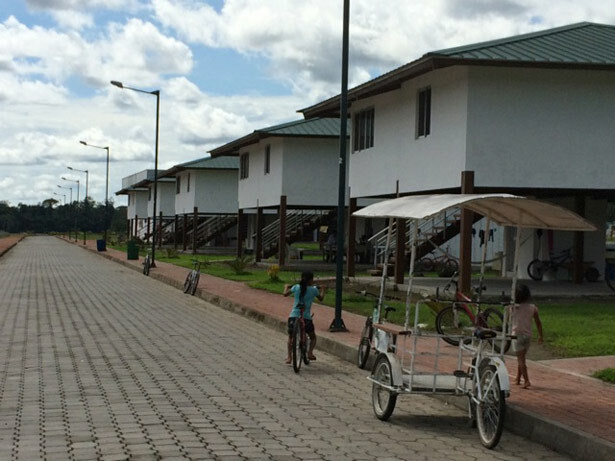 But for Correa’s critics on the left, the new jungle settlements (up to 200 are to be built) are the slickest of bribes, intended to buy smooth passage for the oil companies, both state-owned and foreign, that are lining up to drill in the most remote reaches of the Amazon. Correa’s own popularity, sharpened by fears of a decisive electoral swing to the right, has tempted him to consider seeking a fourth term in 2017. If he mounts another run, the battle over the Amazon oil reserves will be a big talking point in the election, but the outcome will also be shaped by deals being made on the other side of the world, in Beijing. When he took office in 2007, Correa appointed a Debt Audit Commission to determine which of Ecuador’s crushing debt obligations should be honored, and which were illegitimate. It was a bold response to the debt trap that captured so many South American countries during the previous three decades. Acting on the commission’s recommendations, Ecuador defaulted on $3.9 billion of its external debts, and the country instantly became a pariah on the international finance markets. PetroChina offered a lifeline with a $1 billion two-year loan at a 7.25 percent interest rate. In repaying it diligently, Ecuador would be able to reestablish its standing as a trusted borrower. The credit flow from Beijing has only widened and deepened ever since—in return for an ever-larger percentage of the country’s oil production. Last year, Chinese funds were estimated to cover 61 percent of the government’s $6.2 billion in financing needs and, in return, China claimed the lion’s share of Ecuador’s oil. Because it can be sold anywhere by middlemen, much of that oil currently ends up in refineries in California, including some operated by Chevron—the target of a $9.5 billion class-action lawsuit for its alleged contamination of Amazon lands and communities. In 2010 Correa launched an ambitious effort to fund Ecuador’s social programs while keeping the oil in the soil in the Ishpingo-Tambococha-Tuputini (ITT) area of the Yasuni National Park. A single hectare there contains more tree species than all of the United States and Canada combined. 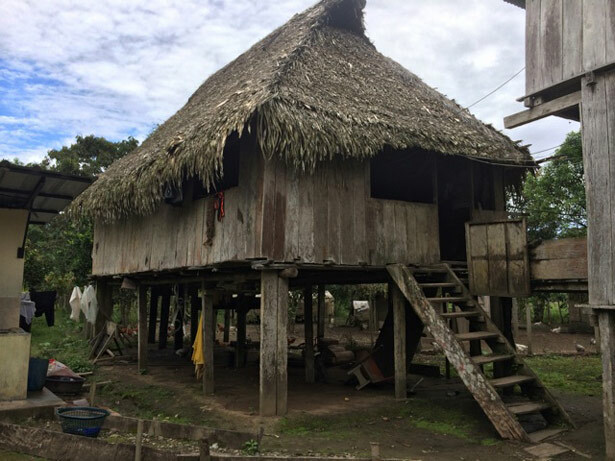 The Yasuni-ITT initiative rested on a key contention of the climate justice movement: that poor countries should be compensated if they are to forego their development to help stabilize global carbon emissions. Correa’s wager was that if carbon-rich countries and donors ponied up enough money to indemnify Ecuador for lost public revenue, then the Yasuni would be left alone. Donations came nowhere close to the $3.6 billion goal set by Correa (50 percent of the market value of the ITT oil reserves). The initiative was terminated, and the government began developing the ITT oil blocks through Petroamazonas, the state oil company, adding to the Yasuni concessions purchased by Andes Petroleum, a subsidiary of the China National Petroleum Corporation and SINOPEC. When development drilling in the Yasuni began, the president pledged that drilling would occur in only a minute fraction of the park, and that it would be low-impact. 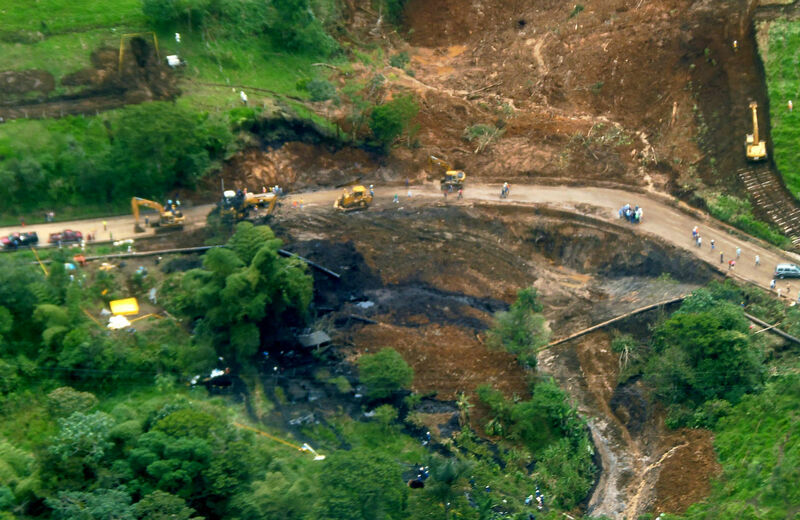 But extractive operations by Petroamazonas are already proving how difficult it will be to keep that promise. In June, a satellite photo revealed that a twenty-six-meter wide road, big enough to handle heavy trucks, had been cut twenty kilometers into the Yasuni. In response, Petroamazonas insisted that it was an “ecological trail” (sendero ecologico), which would be revegetated. In April, a youth collective called the YASunidos submitted nearly 800,000 signatures it had gathered on a petition calling for a national referendum about exploitation of the ITT oil fields. The country’s electoral authority rejected the petition after it claimed to have invalidated many of the names. In August, I arranged to go on a ‘toxic tour’ of some of Petroamazonas’s oil wells with a community ecologist, Wilson Suárez, who lives in a village an hour east of the gritty oil town of Lago Agrio. In the past, Correa has helped to sponsor so-called toxic tours of the jungle areas contaminated during the Texaco era (1964 to 1990). Politico celebrities, such as Daryl Hannah, Bianca Jagger, Trudy Styler and Kerry Kennedy, were encouraged to take the tours to amp up international support for the grueling legal fight against Chevron (the company that swallowed Texaco in 2001). I contacted Suárez because he pointedly does not do the Texaco tour. Instead, he agreed to take me to visit more recent sites, in the Libertador oil field, just south of the Colombian border, that have been contaminated by Petroamazonas. As a public health worker, Suárez had done research for the first community studies of the Texaco production sites in 1993. The evidence he found, of cancer clusters, miscarriages, skin infections, intestinal diseases and respiratory problems, strengthened the case against the American oil giant. One of the major legal complaints against Texaco/Chevron is that the company dodged standard industry procedure by failing to reinject formation waters, sands and other production materials into strata three kilometers underground. To cut costs, the company simply let the sludge accumulate in open, unlined pits and pools. The pollution poisoned the land, the waterways, the air and the people who lived nearby. If the sites that Suárez took me to were representative, they offered ample evidence that the same practices were continuing under the state oil company. We visited several field stations where crude is separated from the gas and formation waters that are brought up along with the “black gold.” Gas pipes vented into the open air or were capped by a bright flare, while sizeable lakes of sludgy water had claimed the forest floor. Though the company had cleaned up a few of the pits by the roadsides—Suárez called them “Potemkin lakes”—there were little or no protections evident on those a hundred yards inland. Small population centers used to enjoy ten-kilometer exclusion zoning, but the laws have changed or they go unenforced. Not 200 yards from Suárez’s own village, the company was now drilling. The river water was no longer potable, and the rainwater increasingly polluted from air contamination. Suárez is from a campesino family who suffered when coffee prices went through the floor, and he knows how desperation can eat away at resistance. In these parts, a family’s survival now depends on at least one of household being on the oil company payroll. As a longtime organizer, he has also seen communities bought off, one by one, or played off against each other. “Population pacification” is how he described the company’s offers of employment, gift packs (of food, clothing, machetes), automobiles, community centers and even the new comunidads themselves. But the president’s promise of a new era of sustainable extraction got dented in July of this year when a pipeline ruptured near an upriver tributary of the Aguarico, just above Dureno. The spill, an estimated 16,000 barrels, spread for almost a hundred miles down through the precious 600,000-hectare Cuyabeno wildlife reserve, as far as Zabalo. 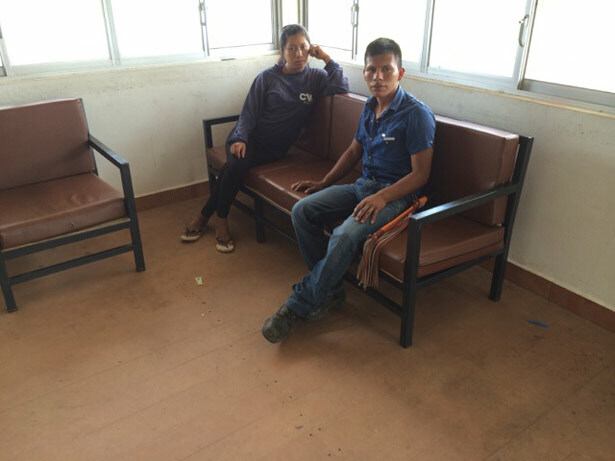 The residents of the new comunidad at Playas de Cuyabeno watched the slick slide by, terrified at the prospect of losing their vital supplies of fish and water. Ramon Noteno, the grandson of a shaman, told me that, through an ayahausca-inspired dream, his grandfather had foretold the calamity, along with the illnesses that would result, and had pre-selected some jungle plants as medicinal insurance against the worst impacts. 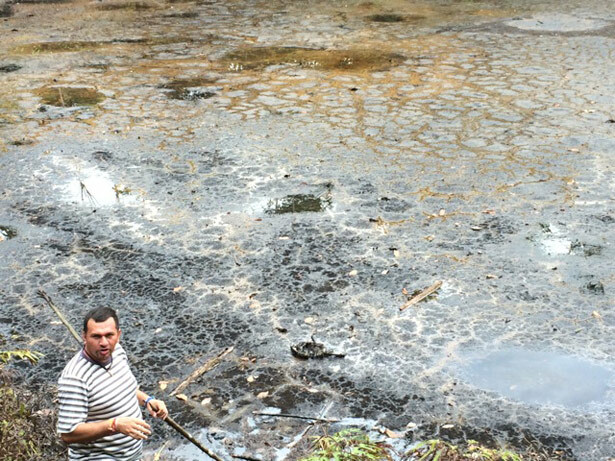 The Dureno spill was also a timely reminder to Noteno and his neighbors, who are being hotly courted by Petroamazonas for permission to drill nearby, that no extraction is fail-safe. The neighboring Siona community, who get little or no benefit from the reserve’s eco-tourist lodges, are keen to take what the company is offering. Afraid of being cut out entirely, and of losing access to common land in between them, the people of the Playas have begun to negotiate. So far, the compensation on the table amounts to a single payment of $1,600 per family ($3,000 for those directly affected by drilling infrastructure), plus rental of their canoes by the company, and some promises of employment. The outgoing comunidad president, Jesús Grefa, reported that “originally, we thought it would be a small operation, but now it’s gotten much bigger and they are talking about a pipeline.” Ultimately, the community has a weak hand to play, because the Ecuadorean state considers all subsurface mineral resources to be public property, and can extract even if the occupants of the land object. (In the United States, what lies beneath the soil is more typically considered private property, though the federal government still holds the rights to 31 percent of subsurface resources, mostly in mineral-rich Western states). For all his worries about the impact of the drilling, Grefa is a Correa partisan, and a firm advocate of the gains furnished by the new village: “Before, we had mud up to our knees.” Noteno has a more measured view. Like most other residents, he has a small farm further downriver, and spends a fraction of his time in the new village. Children attending the school, and their mothers, are the chief occupants. Domiciles in the old village had generous backyards of their own, hosting crops and play areas. Now the amenities are all shared, much like the common-interest developments (CIDs) that are the dominant feature of American suburbia. Houses cannot be sold to outsiders, so there is no speculation, and, while this is not a company town in the lineage of Fordlandia, Henry Ford’s screwball Amazonian colony for his rubber workers, the paternalistic presence of Petroamazonas is keenly felt. A visit to Noteno and his wife’s three-bedroom house, which enjoys a generous riverfront view, revealed a few more cracks in the picture window. The electricity supply is dodgy, the wifi connection is so bad that no one bothers to use it, and problems with the telecom antennae have plagued phone reception. The materials used in construction have made interiors hotter, and the company offers only a five-year guarantee, after which residents are on the hook for repairs and liable to taxation for all governance, utility, and infrastructure needs. The school is the main attraction, but it has lost several teachers already, and recruiting replacements from outside the community to such a remote location will not be easy. Nonetheless, Noteno is optimistic about this new village. But his chief hope is for his children to grow up with the same abundantly diverse jungle wildlife as he did. While large swaths of the Amazon Basin remain uncharted, the most telling maps depict the region carved into numbered oil blocks, some of them hundreds of square miles in area. The Pañacocha field, for example, sits in Block 12; the ITT oil reserve is located in Block 43; and Block 57 is where Suárez took me. The blocks are periodically auctioned off as concessions to oil companies, and more and more of them are marked as a Chinese claim or interest. The Chinese extraction sites are remote, but anyone traversing the Amazon waterways, as I did this past summer, will routinely pass boatfuls of Chinese oil workers. At this point, China exercises a near monopoly on Ecuador’s oil—up to 90 percent this year alone—and is fast becoming the dominant player in mining and mineral extraction. This last issue is quite contentious in Amazon communities where oil production is rapidly becoming the only solid source of livelihoods. PetroChina and Andes Petroleum are only supposed to employ Chinese personnel in highly skilled positions—engineer, toolpusher, project manager—but several locals told me that many of the unskilled jobs also went to Chinese nationals, especially in the more remote regions where regulation was less certain. The situation is reminiscent of scenarios in some African countries, where festering resentment of imported labor teams has sharpened local friction around the presence of Chinese enterprises. Mancero had also reviewed Chinese funding for the country’s massive hydro-electric projects, aimed at providing 93 percent of Ecuador’s energy needs by 2017, and recently served on another Correa commission that recommended the termination of all the nation’s remaining Bilateral Investment Treaties, signed over the last two decades with as many as twenty-six countries. Having seen her share of bad public loans, she was sanguine about the future: “Our debt portfolio is more diversified, and, after the refinery, we will rely less on the Chinese.” She was referring to a large oil refinery, financed through China National Petroleum Corporation, that will be built near Manta, whose Pacific coastal port is also now under Chinese management. When it is fully built out, China will control a complete production logistics line—from the jungle to the coast—to guarantee the smooth delivery of crude to the Asian mainland. If oil were a more prosaic mineral, like copper, then monopolistic moves like this would not raise the same concerns about threats to sovereignty. But oil is always a special case. For countries, like Ecuador, without a diversified economy, extraction is the top priority, and any domestic policy changes are closely monitored from abroad. The World Bank, concerned that China has replaced it as the lender of choice in Latin America, recently returned to Ecuador, issuing a $1 billion loan in April of this year. Notably, the loan carries much better terms (1.24 percent interest over thirty years) than the Chinese ones (typically around 8 percent over eight years). It is worth asking how the new dependency on Chinese credit-for-oil compares with the much-hated former regime of multilateral lending. Unlike that earlier era, where Northern loans covered a broad spectrum of projects, Chinese credit is surgically focused on infrastructure, energy and extraction. Whereas the IMF programs of structural adjustment were aimed at transforming an entire society into an open marketplace, the Chinese, so far, have no such aspirations. But what has been gained from exchanging Chevron for PetroChina? The 2008 revision of Ecuador’s constitution included recognition of the “Rights of Nature”—it was the first nation to do so. Contention over how these new rights should be interpreted almost immediately became a source of discord, resulting in the early resignation of the president of the Constituent Assembly, Alberto Acosta, one of the strongest advocates of constitutional protection for ecosystems. The ongoing strife has widened the gulf between Correa and the social movements that built the pathway for his initial election. Winning a fourth term in 2017 (a feat that will need a constitutional amendment) may require a rapprochement. The alternative—a grisly one—will see Correa running against the leadership of indigenous organizations, like CONAIE, CONFENAIE and Pachakutik, and supporters of environmental groups, like Acción Ecológica. As in the region’s other resource-rich Andean countries, the administration’s reliance on extractivism to fund its cash-transfer programs to the poor has set the stage for a face-off with advocates of more radical environmental policies. In accord with the human-nature communion evoked by Buen Vivir (or sumak kawsay, its indigenous version), Ecuador’s eco-socialists were promised another world, and it’s still possible. But the decisive entry of China’s credit and its hunger for oil and minerals has complicated matters, driving new wedges into the fractured political landscape.